Something must be wrong here: Lietterschpich and TaaPet on the same bill!!! And wrong it is: Prepare yourselves for TEKKURÀ, an utterly improper marathon of live shows and a rave at the beginning of March. 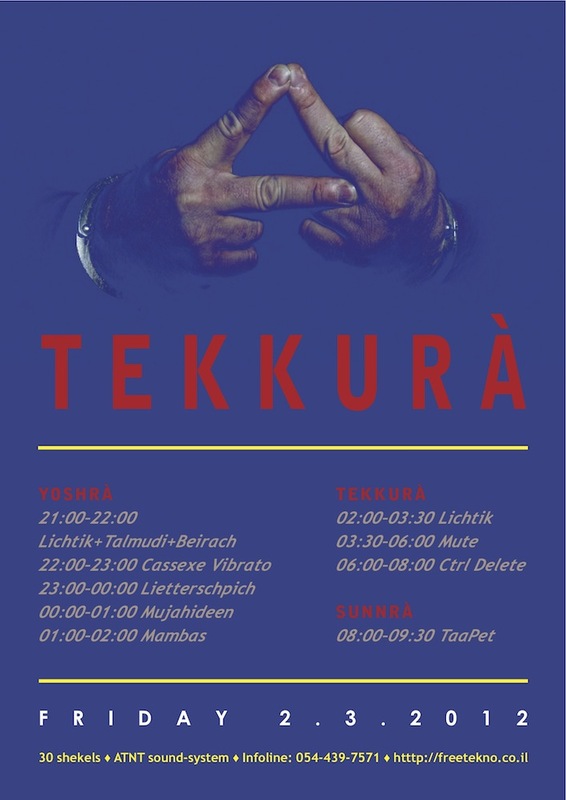 TEKKURÀ is a declaration of independence and solidarity by all the acts that made us deaf, dumb and happy during the past few years, featuring: Mujahideen, Mambas, Ctrl Delete, Ori Lichtik, Mute, Cassexe Vibrato and AvnaZelet, brought to you by the mighty ATNT sound-system. Friday, March 2, 21:00 (till Saturday morning!). As usual, this ATNT service will be located in a place near you… just follow the fReeTEknO website or call the Teknoline: 054-439-7571.